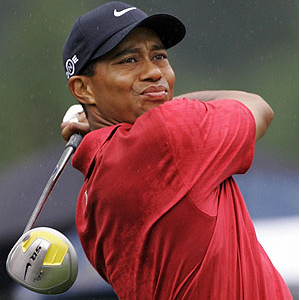 Should Tiger worry about his wayward driver? The beauty of golf lies in its apparent simplicity: the goal is to get the ball in the hole in as few strokes as possible. So many factors go into getting the ball into that hole, however, that scoring is the furthest thing from simplicity. For professional golfers (and for all golfers, really), success can be measured by their scoring average. The inevitable question is then what goes into a scoring average? Which parts of the game, from driving to putting to short game, are significant predictors of better scoring? How should a PGA Tour player prioritize his practice to emphasize factors significant in scoring? Join me after the jump as I attempt to answer these questions and more. The three variables listed are all strongly predictive of scoring average (Pvalues<0.001). An increase of 1 GIR per round was associated with a scoring average decrease of more than a shot, while an extra putt per round increased scoring average by .69 shots. These predictive results are not unexpected; ballstriking skills (more GIR), better putting, and better shortgame (scrambling percentage) are all skills commonly held to produce better scores. It is interesting that GIR was far and away the most influential predictor of scoring average. What is missing, however, is much more interesting. Neither Driving Accuracy nor Driving Distance was found to be a predictor of scoring average. Conventional wisdom suggests that these factors do matter; after all, wouldn’t the average golfer (or PGA Tour player) believe that he or she would play better if they could hit the ball farther and more accurately off of the tee? For PGA Tour pros, at least, that is not the case. The implications for this finding are quite large. In order to maximize the efficiency of their practice, PGA Tour players should heavily emphasize ballstriking, putting, and short game over driving. I think it’s safe to say that in purely statistical terms, players today spend too much time and effort practicing driving. Of course, there are problems with this study, the main one being the possible effect of multicollinearity, especially between GIR per round and Putts per round. Because the average length of a putt is much longer when a green is hit in regulation (from further away) than when the player misses the green and (on average) chips the ball closer to the pin, players who hit more greens will tend to have longer putts, and thus more putts. Finally, it would be very interesting to run a similar analysis for golfers of different skill levels. Are the factors that predict the average amateur golfer’s scoring average the same or different than those that predict a PGA Tour pro’s scoring average? One explanation for driving not being a predictor of scoring for PGA Tour players is that precisely because they are professional goflers, they are all good enough to have a baseline skill with the driver that makes individual differences in driving accuracy and distance irrelevant to scoring average. This would probably not be the case for the typical amateur golfer, who might not be as adept off the tee. For now, just remember that the next time the crowd oohs and aahs and commentators marvel at how far a PGA Tour player hits the golf ball, every other facet of his game determines his score, and ultimately his success, more than the driver does. Great job John. I think using some type of entity fixed-effects in your regression for different golf courses could be very interesting. Maybe some courses reward driving/putting more than others.